No more doubts about ESA's Venus Express! Yesterday, ESA's Science Programme Committee (SPC) gave the final go-ahead for the Venus Express mission. The SPC, which met on 4 and 5 November 2002, unanimously confirmed its strong will to bring the mission to realisation. Furthermore, the Committee endorsed and agreed on a solution to the financial issues that had still cast serious doubts on the mission. On 11 July 2002, Europe took a step closer to Venus. At that time, the ESA Science Programme Committee had agreed unanimously to start work on Venus Express. Venus Express would have reused the Mars Express spacecraft design and needed to be ready for launch in 2005. Since then, ESA invested 7 million Euros to start the first mission design phase. However, the mission's fate was not yet final because one nation, Italy, still had not confirmed its participation in the payload. Italy was given until October 2002 to provide its final commitment. At the deadline, Italy could not completely commit to the financial support required for the payload under their responsibility. To rescue the mission, however, the ESA Science Management in collaboration with the Italian Space Agency (ASI) came to several financial proposals, one of which was eventually endorsed by SPC. The Italian contribution to Venus Express will consist of the spare parts of the VIRTIS and PFS experiments and to the ASPERA instrument. ESA will financially contribute to the rest, for an amount of 8.5 million Euros. This amount also covers the integration and testing of the parts of the instruments Italy has taken on and anything else needed to fill other possible gaps to allow the Italian instruments to fly. In exchange for ESA's support, the VIRTIS Science team will be further Europeanised. ESA's management, the Science Programme Committee, the European scientific community, and the national space agencies have worked hard to get this far. ESA Science Director, Professor Southwood, at the end of the SPC works, said: "I'm extremely proud that the SPC managed to bring things together. Now we can clearly say to the scientists and industry: go to work to go to Venus!" With Venus Express, ESA is the only agency world-wide with current plans to visit all the internal planets of the Solar System. 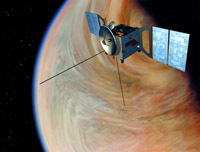 However, both Japan and the United States have plans for future missions to Venus.